Now we already know that you're hooked. So we have decided to create some kind of trilogy after all - Third time's a charm! There are constant debates about crisis, dead-end solutions and the inability to see a bright future. However, micro oppositions to the mainstream culture and structure do appear in reality, you just have to look carefully and open your ears. 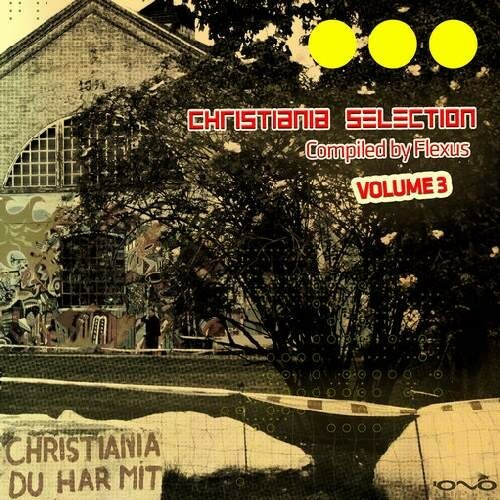 If that is not sufficient enough, Stefan GA ransson, aka Dj Flexus, will guide you to the most beautiful alternative zone ' Christiania Selection vol. 3! This third trip to this enchanting magical dimension will fill you with energies, spirit and inspiration to break from the old formulas you were so used to and create something new, something fresh, something better. We open up the loop-time-hole into Christiania Selection vol. 3 with Morten Granau and Flexus that generate a Green Light District. The Metronome that continues the hues of light gives a special kind of Orange, remodelled by Ma'co. All these different colours beam you into a Lightsphere where most humans become Barefoot and Happy, you can witness that in Flexus interpretation to it! It is easily mistaken for a Fantasy created by Estefano Haze or an Acid Test by Avshi. However, this is something quite different. We are dealing with another Space in Time, which is basically a Simply Wave of various frequencies produced in a specific order. They might cause some kind of Illumination by Lifeforms that have been found by Osher. But this can be supplemented by a Digital Regeneration of a special Opposite8. Therefore, once you will consume the Static Virus you will be rejoiced that it was the famous powerful contagion spread by Static Movement and Cyrus the Virus. Mainly because this is the answer to keep on staying in the Temporary Autonomous Zone called Chriatiania Selection.